User backuppc will be created upon installation. 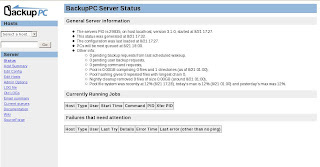 Change apache user to backuppc. backuppc ALL=NOPASSWD:/bin/gtar,/bin/tar # enable user backuppc to run /bin/tar and /bin/gtar without authentication. After this, you have to do almost all the configuration through the web interface. To test, you can run localhost backup first. You have to create the host, fill up all the setting and you are ready to go. Record the host and ip in /etc/hosts. backupuser ALL=NOPASSWD:/bin/gtar,/bin/tar # enable user backuppc to run /bin/tar and /bin/gtar without authentication. To make sure that the 3rd step is a success, try to ssh to backupuser@client using backuppc user from the server. If no password is asked, then you are ready. this setup is great, but on Client setup #3 where it is telling you to create the keys I keep getting the error "Permission denied" to create the directory and the key. I am a noob and basically try to follow the instructions to the "T", what can I do to make this work? may i know what user u use when the error appeared? Thanks for the how-to. I've been struggling with this for two days under other directions. Hi Dan, check if the backuppc user's home directory exists and is owned by backuppc. If not, mkdir /home/backuppc && chown backuppc:backuppc /home/backuppc and then try it again. I would greatly appreciate any help out of this problem. I get problem from the begining. How to solve the below problem? Package perl-Compress-Zlib - 1.42-1.fc6.i386 is already installed. Package perl-Archive-Zip - 1.16-1.2.1.noarch is already installed. Starting BackupPC: Can't locate BackupPC/Lib.pm in @INC (@INC contains: /usr/lib /usr/lib64/perl5/site_perl/5.8.8/x86_64-linux-thread-multi /usr/lib64/perl5/site_perl/5.8.7/x86_64-linux-thread-multi /usr/lib64/perl5/site_perl/5.8.6/x86_64-linux-thread-multi /usr/lib64/perl5/site_perl/5.8.5/x86_64-linux-thread-multi /usr/lib/perl5/site_perl/5.8.8 /usr/lib/perl5/site_perl/5.8.7 /usr/lib/perl5/site_perl/5.8.6 /usr/lib/perl5/site_perl/5.8.5 /usr/lib/perl5/site_perl /usr/lib64/perl5/vendor_perl/5.8.8/x86_64-linux-thread-multi /usr/lib64/perl5/vendor_perl/5.8.7/x86_64-linux-thread-multi /usr/lib64/perl5/vendor_perl/5.8.6/x86_64-linux-thread-multi /usr/lib64/perl5/vendor_perl/5.8.5/x86_64-linux-thread-multi /usr/lib/perl5/vendor_perl/5.8.8 /usr/lib/perl5/vendor_perl/5.8.7 /usr/lib/perl5/vendor_perl/5.8.6 /usr/lib/perl5/vendor_perl/5.8.5 /usr/lib/perl5/vendor_perl /usr/lib64/perl5/5.8.8/x86_64-linux-thread-multi /usr/lib/perl5/5.8.8 .) at /usr/bin/BackupPC line 60. I've followed it as mentioned above, but got stuck here..
Pls look into it for me. I followed your instructions to a T! However I got the message saying I could not connect to backuppc server. I had to disabled selinux to get the sucker working. I used the instructions on this website. I don't know how dangerous this is. But it doesn't matter as this box for me is behind a firewall. Thanks for taking the time to help us out.